Well, there is a lot to report here so I will try to make this quick. 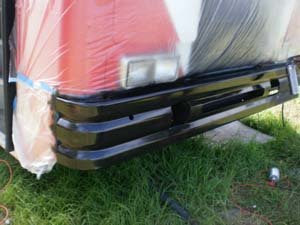 We decided to sand down and repaint the front and rear bumper. They turned out great! 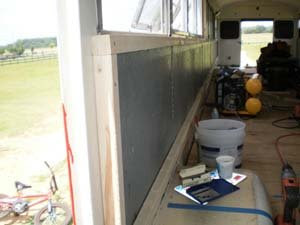 Being that the rear of the bus is going to be a storage area we blacked out the rear windows and the two rear side windows. The glass was already removed so that we could paint the bus so I figured this was the best time to do it. 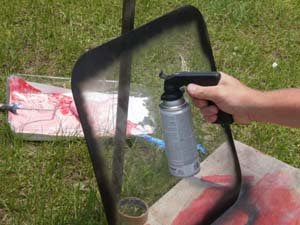 And then spray painted the interior side of the glass with flat black paint. From the outside it appears as though the windows have a really dark tint. You would never know it was spray paint. Re-installing the windows could be one of the hardest things I have done so far on this bus. They come out pretty easy but they go back with much difficulty. 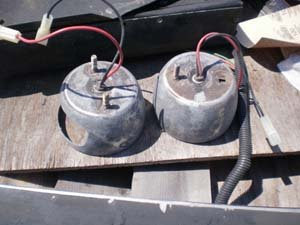 I tried to find some info online of easy ways tricks to re-installing them but had no luck finding any thing. After struggling with the windows for hours a new method was discovered. 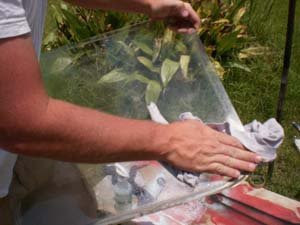 This is how we ended up doing it and it did save a lot of time. 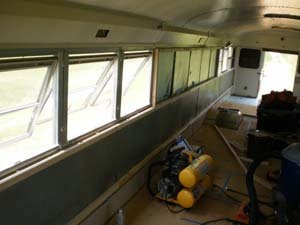 First we took the surrounding rubber off the windows and cleaned the rubber. 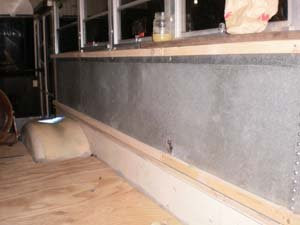 I placed the rubber back around the windows, then we put some thick string on the inside of the channel all the way around the window leaving the two ends hanging freely out the bottom. We then slid the bottom of the rubber over the bottom metal flange. 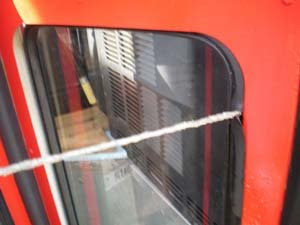 With some down pressure on the window and lots of soapy water around the string and the rubber, we pulled the string slowly around the window and the rubber pulled outward and popped into place. Hope all that made sense. 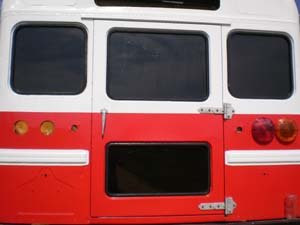 The last thing to be done is put in the little piece of rubber stripping that prevents the window from popping back out of place. I am sure there is a tool out there somewhere meant for doing this but I had to settle with a paint can opener for this job. These are the tail/brake lights. I was just going to throw them away and get new ones because they looked so bad. I was in the mood for saving money so I decided to try refurbishing them. 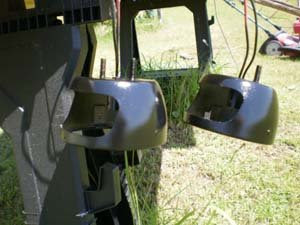 Then I wiped them down with thinner..
Then I primed them with X-I-M.
Then painted them with ACE Gloss Black Rust Stop. I have them pictured here hanging to dry. They turned out looking brand new! 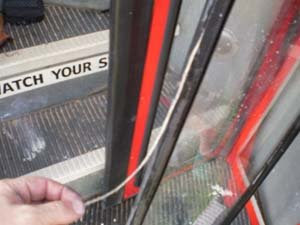 We went ahead and decided to touch up the inside of the bus where the "Emergency Exit" stickers used to be. When we removed them they took off some paint and left some sticky residue. 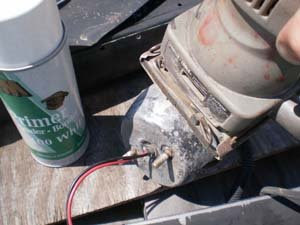 We rubbed the area with some paint thinner and lightly sanded the metal down. I had a can of Rustolium Almond Gloss paint sitting around. It seemed to match good. 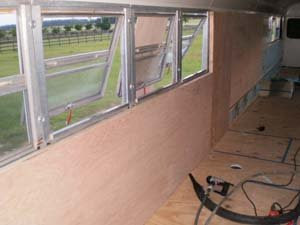 At this point we were ready for our framing package for the inside of the bus. We went to Lowe's and the bill was almost $800. 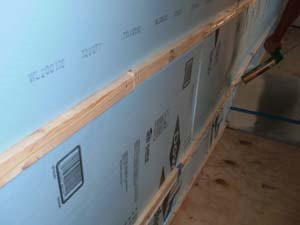 HOPEFULLY we got all we need to frame up the inside. A few highlights from our purchase. Lowe's had a solid wood bi fold door on closeout usually $160. We got it for $22.07. I will be able to take apart this door to make two 12" closet doors. All the 1/4" oak plywood they discounted from $21 to around $14 per sheet. Also the luon usually $10 a sheet we got for $5 a sheet. 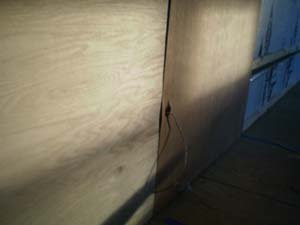 We also purchased 1 sheet of 3/4 oak plywood for the kitchen cabinets usually $47 a sheet. We got it for $27. Many times it is worth asking for a discount. Ask and you just may receive. We did! Now we have started on the interior. First we put furring strips on the passenger side. 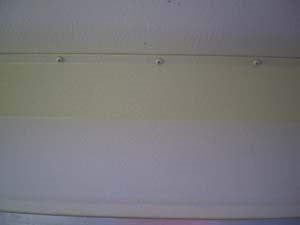 There is a metal flange that runs down the length of the bus that the seats were bolted to. I put the middle furring strip about an inch above the metal flange. 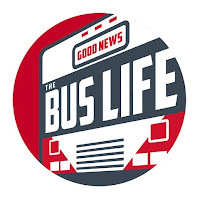 This gave me a channel that runs the full length of the bus that I can run any electrical wiring in. 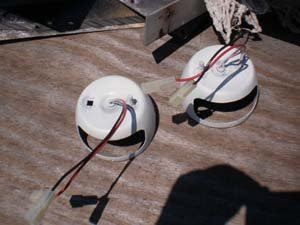 We ran a couple strings in the channel so we can pull any wire through that we may need. 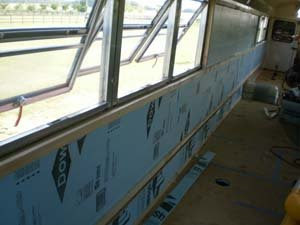 Before we laid our bottom furring strip we installed window flashing where the wall meets the plywood sub floor. 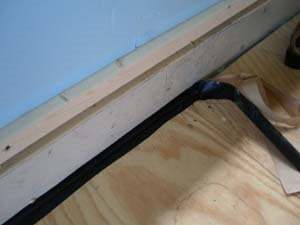 In case water ever comes in through an open window or something, water will not be able to get under the plywood and foam. 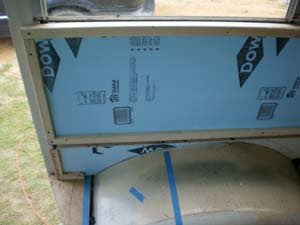 Next we filled the space in-between the furring strips with 3/4" R-4 Construction foam. Now we are ready for the wood. 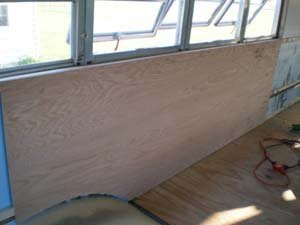 All visible wood will be the 1/4" Oak plywood. We will be using the Luon in places like closets, compartments and behind the cabinets. Here is the first piece of Oak Plywood. 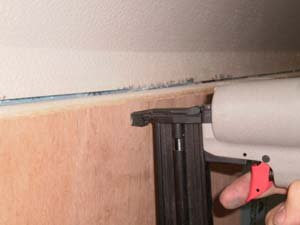 We are attaching the plywood by applying liquid nails to the furring strips and then using a brad nailer to secure it in place. 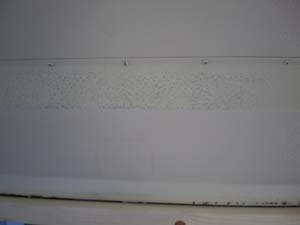 In the next pic you can see the vertical piece of Luon (a closet will be here) with a hole and string coming out of it. The string will make a way for me to pull electrical wire to the inside of the wall that is yet to be framed up. 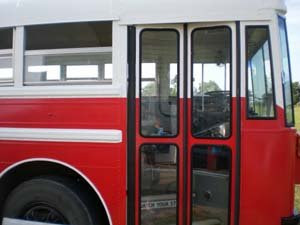 It feels like a silly question but how do you attach your wooden rails to the side of the bus? I first thought you would screw them in from the outside but seeing as you just painted the outside it seems unlikely. We screwed the strips into the vertical support columns / ribbing. What model AC unit did you find for ~$325? Does it do heat as well, AC or DC? I'm about to purchase one for my bus conversion. 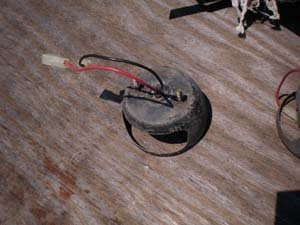 @FranklinJohnson - I found my unit on eBay. It was a used Carrier Unit with a heat strip. Still works great.